The scaled agile framework has evolved to be a common approach for large enterprises adopt agile delivery practices at scale where they need to manage governance, coordination, and cross project collaboration. Before explaining how GitLab can support SAFe, a brief overview of the GitLab project and portfolio model help. This slide deck is where we have been collaborating internally about how GitLab can support the Scaled Agile Framework. The GitLab Project is much, much, much more than simply project management. The GitLab project unlocks the power of an industry leading source code management repository and a CI/CD pipeline. The Merge Request is the linkage between the issue and the actual code changes. The merge request captures the design, implementation details (code changes), discussions (code reviews), approvals, testing (CI Pipeline), and security scans. The issue in Gitlab is the fundamental planning object. It is where the team documents the use case in the description, discusses the approach, estimates the size/effort (issue weight), tracks actual time/effort, assigns work, and tracks progress. Labels enable the team to tag issues, track status, and associate issues with different initiatives. Boards provide a flexible and dynamic approach to visually manage a project. Here, teams can manage their backlog of work, prioritize the items, and then move the issues to the team or specific stage in the project. Each list in the board calculates the total size (weights) of the associated issues, enabling the team to understand how much work is assigned at any given time. Milestones establish a target date for a sprint or specific bundle of issues and code changes to be delivered. The milestone enables the team to either set a specific Start and Stop for the work, as in a Sprint, or the milestone could be a fixed point in time. The label in GitLab is a flexible and powerful mechanism to tag and track work. Labels are used to define columns in the issue boards and make it easy to search and find issues or merge requests related to a common theme. In order to track groups of related projects and issues, the GitLab epic gives product owners and leaders the ability to link and manage work over an extended time frame. An epic can span multiple milestones and makes it easier to manage the overall flow and priority of work. GitLab's structure of Groups, SubGroups and Projects makes it possible to model and support different variations of the Scaled Agile Framework. To support the entire model (the 4 layer SAFe model), an organization would start with a Group to represent the Portfolio planning work. Then the Large Solution part of the model would be a Sub Group. The Programs would each be listed as SubGroups below the Large Solution, and finally the agile teams would work in GitLab Projects, each modeled as part of "Programs". The agile team is the foundation of the Scaled Agile Framework, it is where teams organize, plan, and actually deliver new features. In Gitlab, the project is the fundamental team work area. In GitLab projects teams manage their backlog of use cases (issues), assign work (boards), collaborate on features (issue discussions), develop code (merge requests), review changes (merge request discussions), and integrate and deploy applications (CI/CD pipelines). 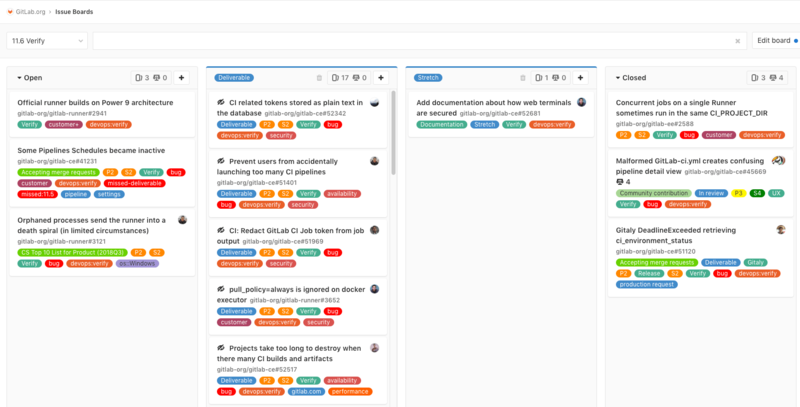 GitLab issues and issue boards enable the project team to capture, manage and prioritize their backlog. They can prioritize their issues directly in the issue board, or they can use labels to establish overall priority of issues. Project level milestones are used to define time based sprints. Issues are added to the milestone and then GitLab enables burndown charts to visualize the progress of the team in closing issues and delivering new features. Project issue board helps teams to visualize and manage the flow of their work, with the ability to track the overall 'weight' of all the issues assigned to any specific stage in the board. Agile Release Trains enable cross project collaboration and coordination of work to meet specific release targets. In GitLab, the Group Level boards and labels are used to define specific stages in the release train and to track how project level issues and merge requests are progressing toward being ready to release. The Program Increment is a smaller time frame than the Agile Release Train, and is managed in Gitlab using group level boards and labels. In order to coordinate how multiple dimensions of a complex solution are delivered, the Large Solution layer of the scaled agile framework is designed to facilitate cross project coordination. In GitLab, a subgroup can enables oversight and coordination of both projects and additional subgroups. Solution Trains enable cross project collaboration and coordination of work to meet specific release targets. In GitLab, the Group boards and labels are used to define specific stages in the solution train and to track how project level issues and merge requests are progressing toward being ready to release. At the top of the Scaled Agile Framework is where portfolio and strategic planning drive decisions about future investments and business objectives. In Gitlab, the Group is able to contain both Projects and Subgroups, to enable reporting, tracking and management of strategic initiatives. Strategic themes are effectively long term goals and objectives at the portfolio level. In GitLab, the Epic at the group level can be used to define the overall theme. The epic is a way to package and organize work required to deliver specific business value. In GitLab, Epics are a way to strategically organize work from multiple projects.